Members of the Medical Element watched military working dog demonstrations at Soto Cano Air Base, Honduras, March 27. The demonstrations were part of an ongoing MEDEL training to familiarize medical professionals who do not work in the veterinary sciences with the dogs and how to assist them. 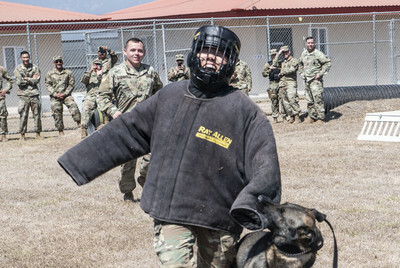 “These medics, nurses, doctors and other health care professionals are learning how MWD’s train for their security mission,” said Col. Loren Adams, MEDEL veterinarian. “You never know when a little knowledge about someone else’s mission or job will be important of even life-saving”. Handlers walked MEDEL Soldiers through an obstacle course, aggressor training and detection training as their canine companions performed each aspect. Earlier in the month, MEDEL members learned about canine anatomy and physiology and are scheduled to learn how to administer fluids and other first aid prior to participating in a culmination exercise where MEDEL and the MWD handlers will respond to a simulated incident. After the multi-week training is complete, another unit of MEDEL is slated to take the reins and hold lessons about their military occupational specialty.